Rwanda’s only major international airport is located in Kigali. It runs daily flights to cities across the African continent, as well as to global transit destinations like Amsterdam, Brussels, Dubai, Istanbul, London, and Mumbai. Nearing the city centre, futuristic buildings span the metropolis. The massive dome of the Kigali Convention Centre is a highlight. For its humble size, Kigali seems to have many feathers on its cap. Since the genocide of 1994, Rwanda has sustained high economic growth, and alongside it, the Kagame administration has ensured that Rwanda remains at the forefront of technological innovation in Africa. The government’s Information and Communications Technology (ICT) Policy was outlined in its Vision 2020 document, which was first published in 2000 and has been revised every year. One of its key goals includes increasing internet and mobile phone access across the densely-populated country. The goals have been met ahead of target and the proliferation of internet access has given way to a number of technological innovations in the country. The government of Rwanda aims to increase access to its services through a versatile online portal called Irembo, which currently permits access to more than 80 services for both Rwandans and foreigners. Foreigners planning to visit Rwanda can apply for visas online, while Rwandans can request marriage certificates, register for driving tests, and seek automated reproductive health advice. In urban areas like Kigali, the local authorities use it to inform citizens of local road closures or water supply issues through text messages. A few kilometers outside Kigali lies a major technological achievement: a £15.6 million solar power plant in the shape of the African continent. It is one of the fastest-built solar power projects in the world; construction finished within a year of contract signatures. 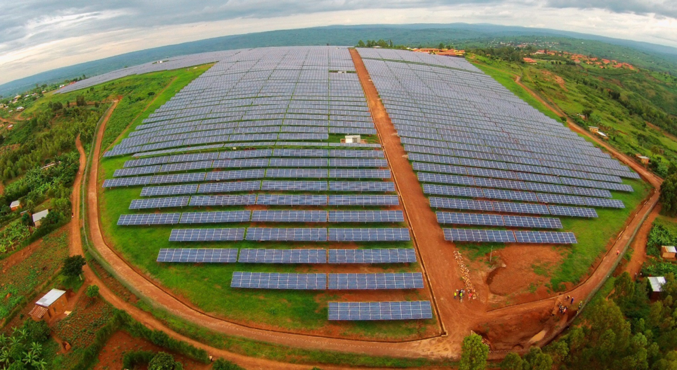 The 8.5 megawatt plant currently supplies six percent of Rwanda’s electricity, but the government has near-term plans to build enough solar generation capacity to satisfy 50% of the country’s domestic power demand. Rwanda’s planners believe that zero-emission growth is possible, and they are leading by example. Kigali is also the center of an ambitious plan to improve access to vital health supplies across the country. Due to Rwanda’s hilly terrain, traveling short distances by road can take hours. However, small automated aircrafts can cut such journeys to minutes, and the country is taking advantage. 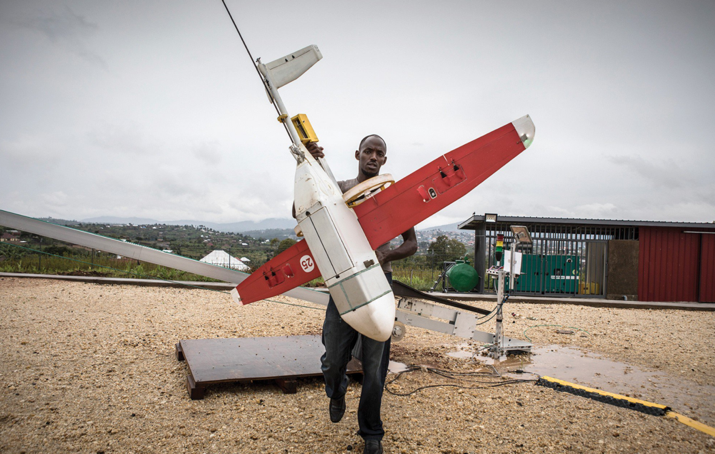 With the help of Zipline, a California-based drone startup, Kigali has become the center of an experiment to supply hospitals through drone delivery. Using a smartphone app, a hospital technician can request a certain quantity of blood, which the central repository of blood, run by the Ministry of Health in Kigali, will dispatch on a drone. Once it arrives, the drone will drop the blood package with a small parachute attached, allowing for more efficient trips and avoiding the need for landing space. The technology will soon begin supplying medicines. Rwanda is also leading on public transport payment technology. Most bus routes in Kigali now only accept payments through the tap of a card, the first system of its kind in the African continent. Developed by a small Rwandan tech company, this method of payment has reduced delays and is already diffusing to other African cities, including Cameroon’s capital, Yaounde – much larger than Kigali. Local payment apps linked to personal bank accounts and existing mobile payment technologies like M-Pesa are gaining importance as well. Many Rwandan businesses now accept payments through them. As cheap innovations increasingly disrupt traditional service provision, Rwanda is leading the way for its neighbours in the East African region. And at this rate, when it comes to addressing urban challenges through technical solutions, the country may soon lead the Global South. Chinmay Rayarikar is a Development Studies MPhil student at the University of Oxford. He is currently interested in urban spaces and technology with an emphasis on the Global South and has conducted research on refugee integration in the United States, transit systems in China, and urban planning in Rwanda. He holds a bachelor’s degree in International Studies and Urban Studies from Trinity College in Hartford, Connecticut.